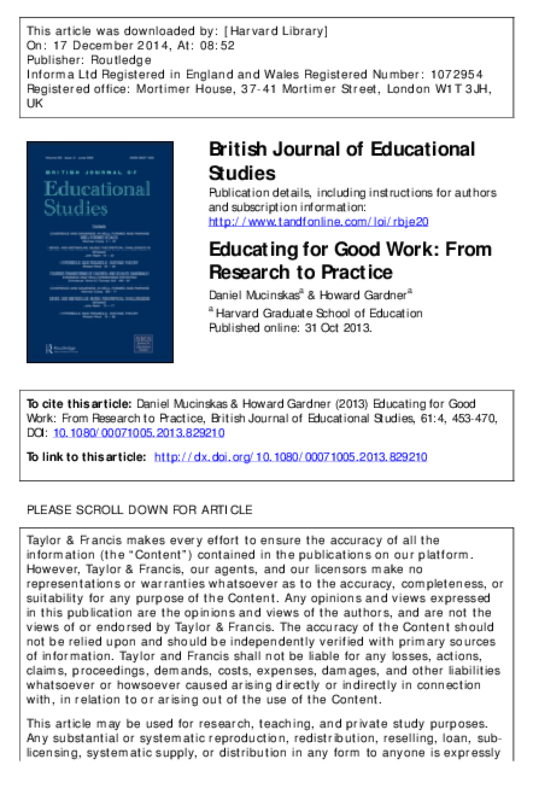 Launched in 1995, the GoodWork Project is a long-term, multi-site effort to understand the nature of good work across the professional landscape and to promote its achievement by relevant groups of students and professionals. In this essay, the authors review the goals and methods of the initial research project and its most salient findings. They describe the GoodWork Toolkit, a versatile instrument that consists of actual dilemmas faced by professionals, along with exercises designed to make the issues salient to those who use the Toolkit. Introduced as well is a system of classification of the dilemmas, in terms of their applicability across the professional landscape; and a review of the range of educational settings in which GoodWork materials have been utilized. Copyright 2013 Society for Educational Studies.